Could Gwyneth Paltrow have let slip a big secret for Tony and Pepper in Avengers 4? Peter Jackson may be pondering a return to Middle-Earth, or a weird new adventure. Simon Pegg wants in on a Captain Britain movie. Plus, what’s to come in Riverdale’s season finale, and more casting for Stranger Things season 3. Behold, spoilers! Noted LotR news site The One Ring reports Peter Jackson and his production team are apparently currently deciding between signing on to Amazon’s Lord of the Rings series or boarding an undisclosed Warner Bros. DCEU project. Felicity Jones, Thomas Brodie-Sangster, Patrick Stewart, Freddie Highmore, Meera Syal, Sanjeev Bhaskar, and Nonso Anozie have joined the voice cast of Dragon Rider, an animated film adaptation of the Cornelia Funke novel. According to Coming Soon, Jones will voice a mountain brownie named Sorrel, while Brodie-Sangster plays a silver dragon named Firedrake. Stewart plays the dragon slayer, Nettlebrand, while Highmore is Ben, a human boy. Syal, Bhaskar and Anozie’s roles are all currently undisclosed. Deadline reports director Damian Szifron has been fired from The Six Billion Dollar Man due to both “creative differences” and a “language barrier.” As the Argentinian director co-wrote the film’s script, it’s unclear if Warner Bros. will be searching for a new writer as well. Meanwhile, THR reports Mel Gibson could swoop in to direct, as the actor/director had already been in talks to play Steve Austin’s mentor, Oscar Goldman. A mysterious new post from Mark Hamill’s Twitter account seems to suggest Luke Skywalker will return in Episode IX. Or, you know, Mark Hamill being his usual jokey self. Make of it what you will! I mean, Captain Britain was this Marvel superhero that I loved growing up, ’cause he was the British member of that community. I even have a Captain Britain mask when I was a kid, but I fear I would probably be slightly too old now, but if they do have… If a Captain Britain movie comes about, they’re gonna need a British cast, so… I’ll be waiting. Variety reports Luca Guadagnino’s Suspiria remake is coming to theaters sometime this fall in both Italy and the United States. Deadpool, like Thanos before him, demands your silence when it comes to spoilers, in a new post from Ryan Reynold’s Twitter account. 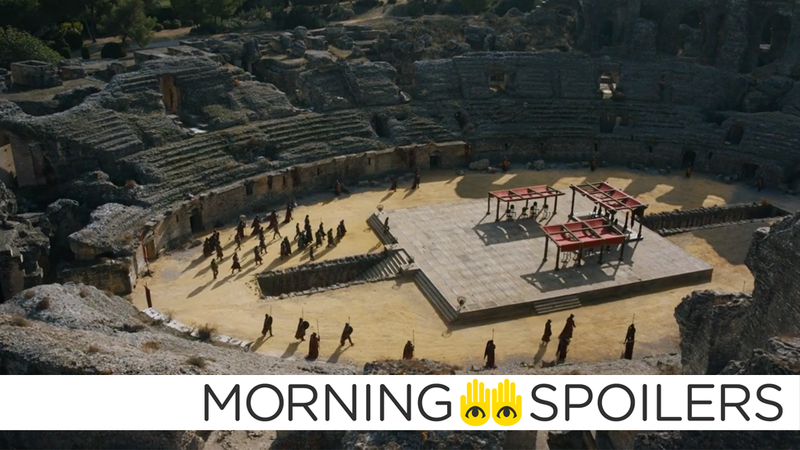 Watchers on the Wall reports that a large gathering of actors in Seville—near the shooting location of the ruins of Itálica, used for the Dragonpit in Thrones’ seventh season—suggests another major gathering of characters in store for the final season. Initial reports put Maisie Williams, who of course plays Arya as vacationing in the city, but new sightings of the body doubles for both Peter Dinklage and Sophie Turner, and Dinklage himself, seem to indicate Tyrion and Sansa will also be heading to the pit this season. Further unconfirmed reports from the site also allege that Kit Harington, Sophie Turner, Isaac Hempstead Wright, Gwendoline Christie, and John Bradley were also seen boarding flights to Seville recently, indicating quite a bit team up of Team Stark-affiliated characters if it ends up being true. Spoiler TV has images from March 23rd’s episode, “Delta V.” More at the link. Coming Soon also has images from this week’s episode of Westworld, “Riddle of the Sphinx.” Head over there for more.